Browse the range of centre pivot roof windows at Roof Windows 4 You, where you'll find a number of great options for increasing the level of natural light in your home. Each unit is made with our signature level of quality, so you can trust these products from one of our core collections. All of these FAKRO centre pivot windows are suitable for roof pitches from 15–90 degrees and we have a wide range of flashings to ensure efficient installation of the units. They're also available in a variety of materials to suit your needs, including white acrylic, natural pine, white PU-coated pine, and white PVC. These centre pivot windows are designed for complete ease of use, with a conveniently located handle that can be operated smoothly and with little effort and a centre pivot mechanism that allows for 180-degree rotation of the sash for accessible cleaning. Our centre pivot rooflights are feature rich. Not only do they make use of our innovative topSafe anti-burglary system to ensure maximum security, but they also benefit from a V40P air-inlet that automatic adjusts the air flow channel size, allowing the optimum amount of flow into a room. Each one of these windows can be equipped with a range of accessories, as well as both internal and external roof window blinds. Take a look at our centre pivot windows and we're confident you'll discover a model that suits your loft conversion or extension. Got any questions about these products? You can give us a call on 0333 600 9090 or get in touch with our team and they'll be happy to help. 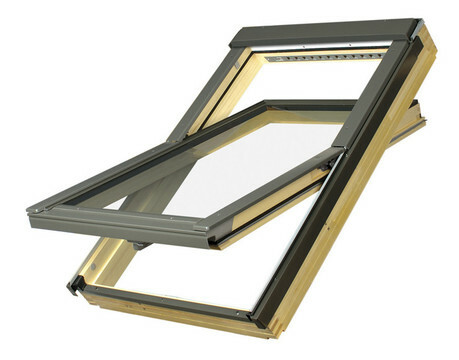 FAKRO centre pivot roof windows open from the middle of the window and can be rotated through 180 degrees to clean the outer pane from within the loft and operate an awning blind. Centre pivot windows can be equipped with both external and internal accessories.